FORT BENNING, Ga. - Several hundred Soldiers and their families turned out here Jan. 29 for an evening of live music, free barbecue and a chance to meet NFL football players and cheerleaders, and - to the delight of many youngsters - the Falcons' fun-loving, mascot "Freddie Falcon." 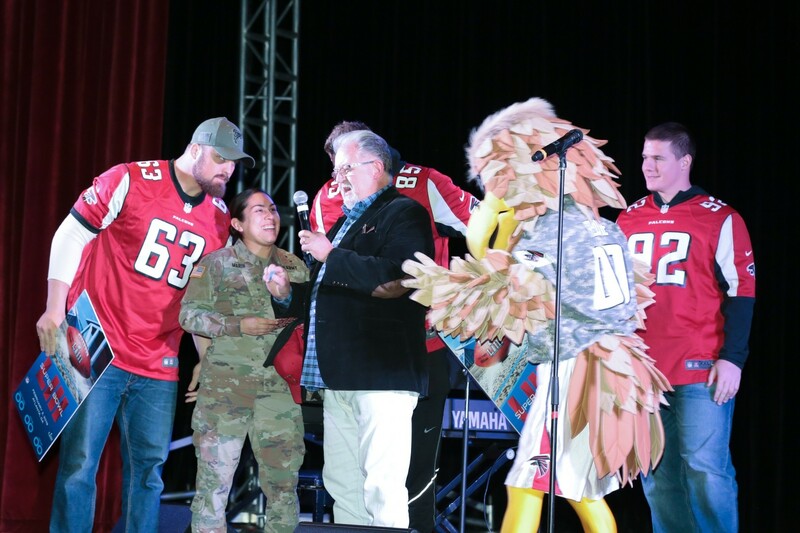 Billed as a "Salute to Service" and sponsored jointly by the USO and the NFL, the event ran from 5 p.m. to shortly after 7 p.m., inside Fort Benning's McGinnis-Wickham Hall. It was meant to show support to U.S. service members and at the same time connect them to the excitement of the upcoming Super Bowl. The New England Patriots and Los Angeles Rams face off Feb. 3 in Atlanta's Mercedes-Benz Stadium for the 2019 Super Bowl. Representing the NFL were six current and former members of the Atlanta Falcons and six Falcons cheerleaders, as well as the bird-costumed, irrepressible "Freddie." Throughout the evening they chatted with Soldiers and posed with them for selfies. Freddie high-fived the kids, danced with them, and in at least one instance allowed one happy youngster to chase him in a circle. The event brought an unexpected thrill to Pvt. Dante Duncan, 18, of Tennessee, who graduated basic training at Fort Benning only days earlier, and is now hoping to qualify for service with the Army's elite 75th Ranger Regiment. Unlike most others Soldiers at the event, Duncan was there pulling a day of "staff duty" at the front desk McGinnis-Wickam Hall. The building is the headquarters of the U.S. Army's Maneuver Center of Excellence. "So I'm here at staff duty and they tell me the Atlanta Falcons players and cheerleaders are gonna be here," said Duncan. He noticed the NFL players posing for selfies with Soldiers and wondered if the players would take one with him too. "I just walked up to 'em, asked them if they minded if we took a picture, and they were real friendly about it and said we could," Duncan said. "And it's just the best staff duty I could ever ask for," he said. The evening began with dinner. The corridors of Fort Benning's McGinnis-Wickam Hall were converted for the evening into a dining area lined with blue chairs and tables laid with white table cloths. On the menu were barbecued chicken and pork, Brunswick stew, cole slaw, various sauces, bread and beverages. 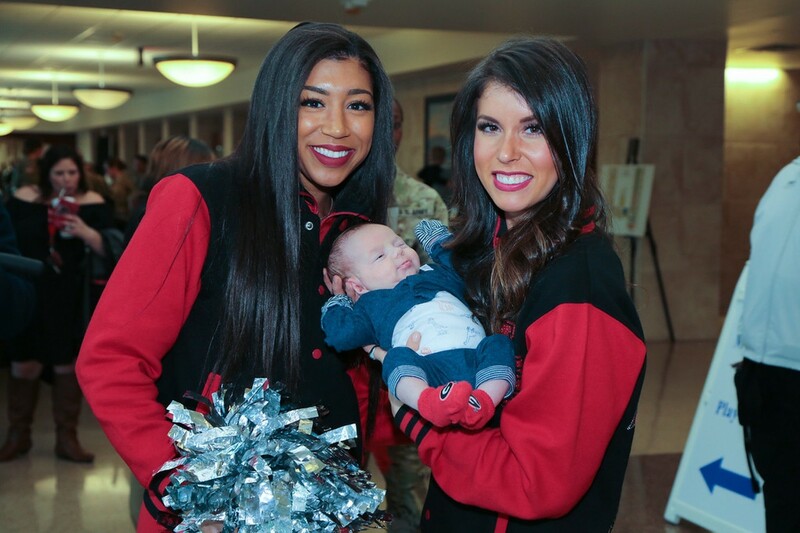 There were also games, giveaways, autographs from the players, a photo station where guests could pose for photos with the cheerleaders, and a "Play 60 Kids Zone." 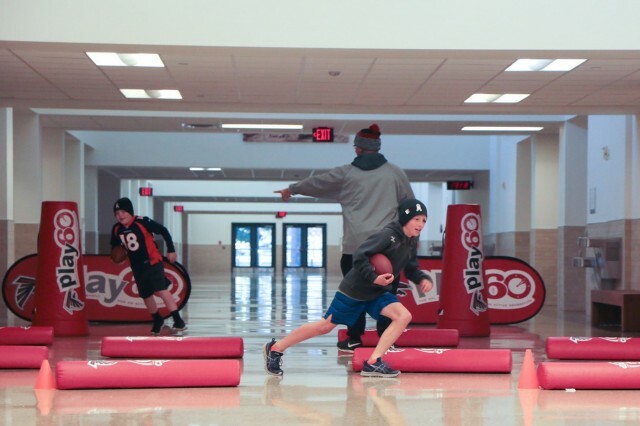 "Play 60" is an NFL national youth health-and-fitness campaign that aims to foster wellness among young football fans by encouraging them to be active for at least 60 minutes a day. Later, Soldiers and families filed into the building's Marshall Auditorium for a live concert by Jordan Smith, season nine winner of the singing competition TV series, "The Voice." 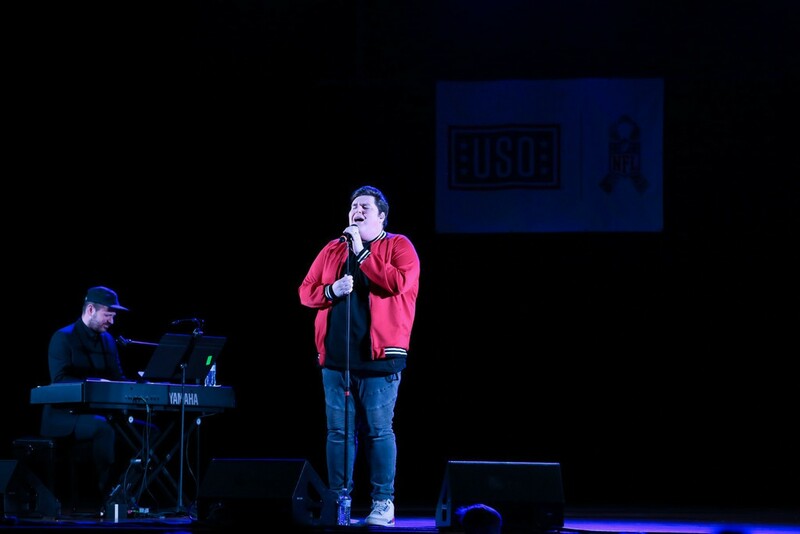 The concert was arranged by the USO, which has partnered with the NFL for 50 years. "The event is a way for us to let them know that wherever they are in the world, the USO is here to support them, and the NFL is there as well," said Ashley Hicks, a USO spokeswoman. Smith wrapped up the concert with "God Bless America," and when he'd sung the last notes, the audience broke into applause, cheers and whistling. It was time for the final event of the evening, a Super Bowl ticket drawing, from a hopper set up onstage. 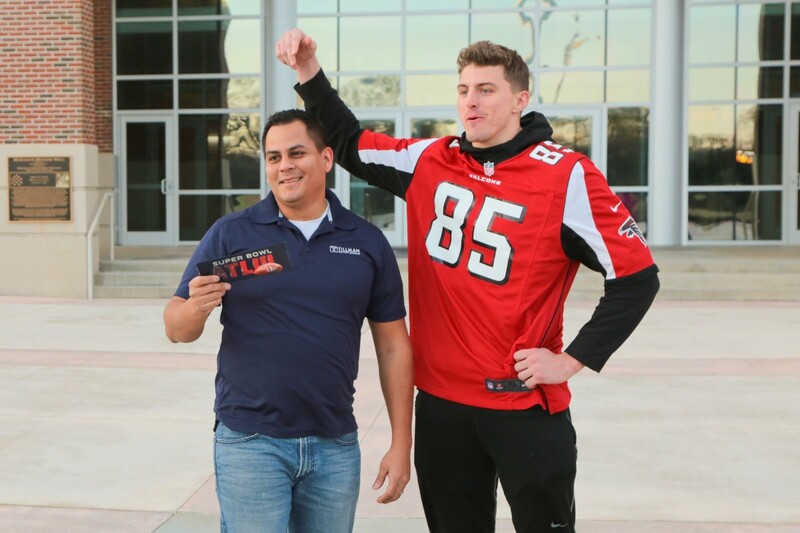 Waiting to draw a ticket was the Falcons' Ben Garland. "Ben," said the announcer, "do the honors. Reach in there. 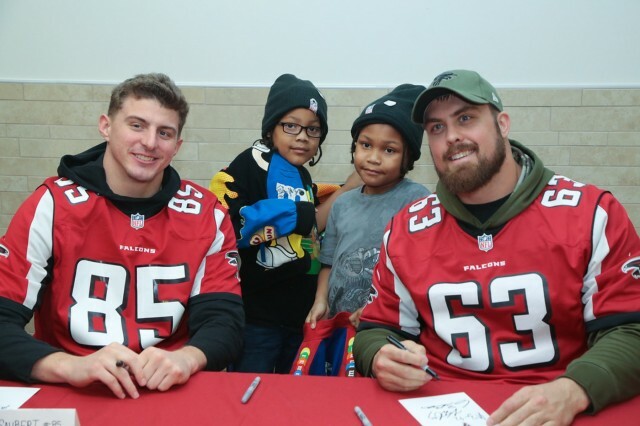 Ben Garland of the Atlanta Falcons." "Alright, here's the lucky number," the announcer said. "Three...two...zero...one...two...nine." With that, a Soldier rose from her seat, and with and arm held high, ran down the aisle and onto the stage, clasping a small blue ticket. She hugged Garland, who, she said later, congratulated her. The Soldier, Staff Sgt. Aide Marin, is a parachute rigger assigned to Fort Benning's Company E, 1st Battalion, 507th Parachute Infantry Regiment. She's a lifelong Dallas Cowboys fan, and her husband is a New England Patriots fan, who owns a Tom Brady jersey. Marin said she makes a point of trying to attend USO and other events at Fort Benning, especially those related to the NFL. But at first she worried she might miss this latest one because of her work schedule packing parachutes. In the end, she was able to wrap up in plenty of time, and came with her husband and two young sons. "We're going to the Super Bowl and go and cheer for the Patriots." Earlier in the evening, the NFL also gave two free Super Bowl tickets to a former Special Forces medic, Erasmo Espino, who has since become a medical doctor and who is also a recipient of a scholarship from the Pat Tillman Foundation. The Foundation supports active-duty service members, veterans and their spouses with academic scholarships and professional development opportunities. Espino said he'd deployed 11 times with the Special Forces during his active-duty service, to Iraq, Afghanistan, and Latin America. "I didn't know they were gonna surprise me with Super Bowl tickets," said Espino. "My wife means the world to me. She's put up with every deployment. I'm happy to take my wife to the Super Bowl."